I’m notorious for challenging my son. Sometimes it’s academically. Sometimes it’s to get him out of his comfort zone. And sometimes… it’s for his health and physical well-being. I also like to challenge myself. 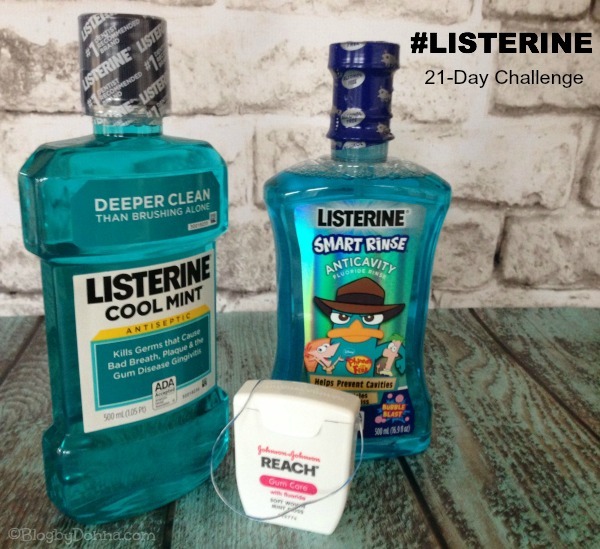 Which led me to our newest challenge — the Listerine oral health challenge. Maybe it’s because I have a boy, but it is a challenge to get him to brush his teeth as long as he should and flossing and rinsing is a downright battle sometimes. I’ve also realized that I don’t always floss, and just maybe, I don’t brush my teeth as long as I should. I’m so busy and always on the go, that I don’t take as much time as I should when it comes to my oral hygiene. Why, challenge her 11-year-old son to see which one of them can do a better job at brushing, flossing, and rinsing. My son takes his competitive spirit after me, so he took me up on the Listerine Oral Health challenge. Seriously, I really need to make the time to take better care of my oral health. I know how important good oral health is, but I put it on the back burner because I’m trying to do so many things (most of them for others) that I neglect myself. I have to do better. I think the Listerine 21-day challenge is a great way place to start. I’ve been noticing some gum redness and some sensitivity lately, too. So I’ve got to nip this in the bud. I also want to be a good example for my son… this, “Do as I say, not as I do” attitude just doesn’t fly. And making it a friendly competition will make it fun and will help my son develop a good oral health routine. And research shows, it takes 21 days to form a habit. Taking the challenge can also help children in need. For every person who posts a “Swish Selfie” to LISTERINE® Brand’s Facebook page, LISTERINE® Brand will make a $5.00 contribution to Oral Health America’s Smiles Across America® program, up to $85,000, toward their goal of connecting 210,000 children with needed oral health services in 2014. Now this is a challenge everyone should take! In fact, I do challenge YOU! I challenge you to join my son and I in improving your own oral care, and to help children in need, by posting your own “Swish Selfies” to LISTERINE® Brand’s Facebook page (www.facebook.com/listerine). Once there, you can learn more about the challenge, the partnership with Oral Health America, and check out a roundup of the best “Swish Selfie” photos of the week. So get to Target, pick up your supplies and join me in the Listerine 21-Day Listerine Oral Health Challenge! And check back in 21 days to see how we did! What is your (or your children’s) biggest oral health challenges? I really like the Citrus (orange one) that Listerine has. It is pretty strong but does a great job at freshening my mouth up!! My kids’ biggest oral health challenges are 1) not brushing for long enough 2) not brushing thoroughly enough. Getting to those back teeth is always a toughie that I end up having to help redo. Also, making sure they brush their tongues is a battle. My kids often struggle with brushing for an appropriate amount of time. I have to make sure they brush twice to solve the problem. They do enjoy rinsing with mouthwash after they brush though! I love my Listerine. I use it every day. Listerine is our FAVORITE mouth wash. It’s the only one that tingles and actually feels like it’s working. I really like these products. They are the only ones that I can use at night and not wake up with my mouth feeling disgusting! I think I am going to accept this challenge with you and get my boys in on it too. They often forget to brush, and floss? Well, this just may be the way to get things rolling again! I have tried every brand imaginable. I always come back to Listerine! I didn’t even know they had a kids version of Listerine! Cool! I think its great they are making mouth health more fun for kids, good habits early! We have just started doing this same challenge. Thanks for sharing! I love the Cool Mint flavor. Definitely my favorite. And personally, my biggest challenge is that I never floss and I know I really should. I didn’t know there is a kid’s version! We really like Listerine. I am going to have the entire family take part in the challenge. Listerine is the favorite in our household! I wasn’t aware there was a kid’s version! My fave is the cool mint flavour. Listerine is a MUST HAVE for all bathrooms! It wakes me uP! My biggest challenge is getting them to brush when they are tired. I am a fan of the Listerine! I wanted to hear more lol lol. Im amazed that your 11 yr old BOY agreed to this. lol lol Goget em mom!! We are doing this challenge too and I am excited to see how my kids feel at the end of it. Listerine is the only mouthwash I use because it actually works. Getting the toddler to brush his teeth and not just chew on the toothbrush. Flossing is definitely a big challenge for both of us. I hate doing it because my gums are so sensitive, although I know that flossing will make it better. &My son just hates it completely. My biggest challenge is regularity with flossing! My kids hated the dentist when they were younger and flossing, now as adults they are the opposite, great challenge for your son! I am a Listerine believer. I took this last year and now I use Listerine toothpaste and mouthwash all the time. I love that you all are doing this together, sounds like something I would do lol. I had no idea that they had listerine products for kids! 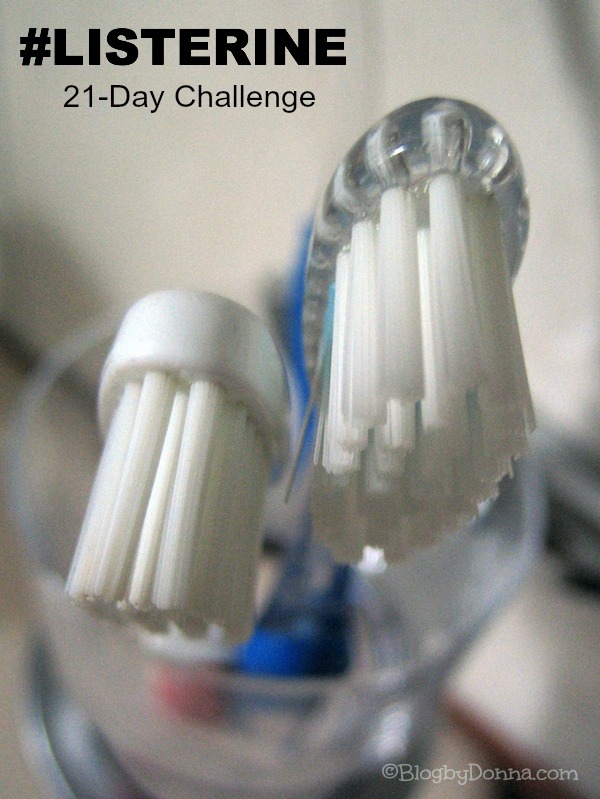 Way to take on this challenge, especially since it improves your oral health. How is your challenge going? The first few days, I didn’t notice too much of a difference, still waking up with morning breath. But these last few days have been much better and my teeth feel clean longer. You experiencing the same effect? I didn’t know they made a product for kids? I’ll have to pick some up for my children.